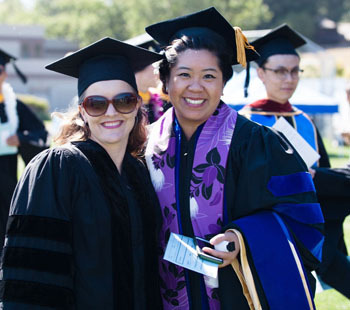 Bubbles floated in the air and fresh-flower leis ruffled in the breeze as scholars and their supporters gathered over the weekend for a very special edition of UC Santa Cruz commencement, falling on the year of the campus's 50th anniversary. More than 4,000 undergraduates received bachelor's degrees for work completed in the arts, engineering, humanities, physical and biological sciences, and social sciences during the 2014-2015 academic year. In the graduate division, 77 doctoral degrees were awarded for summer, fall, and winter; another 99 candidates have applied for spring Ph.D. degrees. Every one of those degrees is a story of determination, sacrifice, life changes, and hard work. Tracy Perkins, 35, on the verge of receiving her Ph.D. in sociology, could hardly believe it was happening; she had been working toward this goal for nine years—seven as a Ph.D candidate, and two years in pursuit of her master's degree. Perkins, who studied environmental sociology and social movements, and researched social justice activism, loved teaching undergraduates, an experience that bolstered her even when her research was daunting. "They were learning sponges," she said of her students. While she's thrilled to be heading off to Howard University in Washington, D.C., where she will be an assistant professor in the Department of Sociology, leaving UC Santa Cruz is bittersweet. "I just taught my last class here on Wednesday!" she said, adding that it was hard to say goodbye. Walking beside Perkins was her friend Yvonne Kwan, who was beaming—and for good reason. Now that she's received her Ph.D. in sociology after six years of work, she will head off to Dartmouth College as a postdoctoral fellow in September. Out of more than 1,700 applicants, only five were selected for this position. Graduates, aside from reveling in their accomplishments, also had a chance to learn from Slugs who passed through the same forested campus years ago. An array of high-profile alumni speakers greeted the graduates this year including NPR science correspondent Joe Palca ( Ph.D. '82, psychology) and two Pulitzer Prize winners—Héctor Tobar (Oakes '88, Latin American/Latino studies and sociology), and Martha Mendoza (Kresge '88, individual major). Palca exhorted the graduates to ask questions, listen, and be persistent. "When you're done, stop talking," he advised. 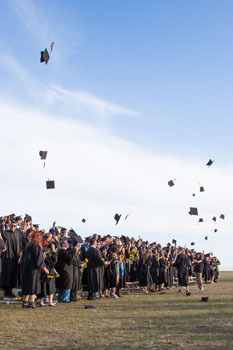 He also counseled grads to remember their humanity and appreciate what they've learned. "So I know there are people in this audience who are thinking, 'Great…now I am the world's expert in the "Dietary Ecology of Coastal Coyotes," or "The Politics of Socialist Athletics in the People's Republic of China, 1949-1966," or "Effects of Cold Ambient Temperature on Human Sleep, Metabolism, and Thermoregulation,"'" Palca said. "Will this do me much good in the real world? Forget about the specifics. You've learned how to tackle a problem and wrestle it to the ground." Tobar, addressing College Nine, reflected on the remarkable natural beauty of UC Santa Cruz, and lost himself in the nostalgia of the moment. "My own daughter, who I brought to this campus … when she was 7 years old, stood by one of the buildings, underneath a grove of towering redwoods, and asked the very simple but obvious question: 'Papá, why did they put a college in the forest?' I thought about this question for a moment, and answered: 'Because it's a good place to concentrate, and to think big thoughts.'" Time, and the timelessness of his education and college experience, was very much on Tobar's mind. "One day in the future, you too will be at a place that's far from here, and you too will realize how much your UC Santa Cruz self, and the college community in which you lived, are still with you," he continued. Mendoza, addressing the Kresge crowd, blended inspiration with good old-fashioned hard-nosed advice. "A child knows right and wrong," she said. "But justice, that's more complex. You've got to be conscious, present, looking for injustice and shouting it out." She added that grads should show up on time—always. "Every single day," she emphasized. "Not five minutes late. No excuses. Be there on time. Ready to go. Year in and year out." John Laird (Stevenson '72, politics), California's Secretary for Natural Resources and one of the nation's first openly gay mayors, had a simple, direct, and effective message for the Cowell College crowd: Pay it forward and be bold. "When I graduated from UCSC, it was illegal to be gay in all 50 states," Laird said. "When I sat at my graduation, I was just coming to terms with the fact that I was gay. And I thought I would have to choose between being clear about who I was, and moving ahead in the field of public policy that I thought I was best suited for.